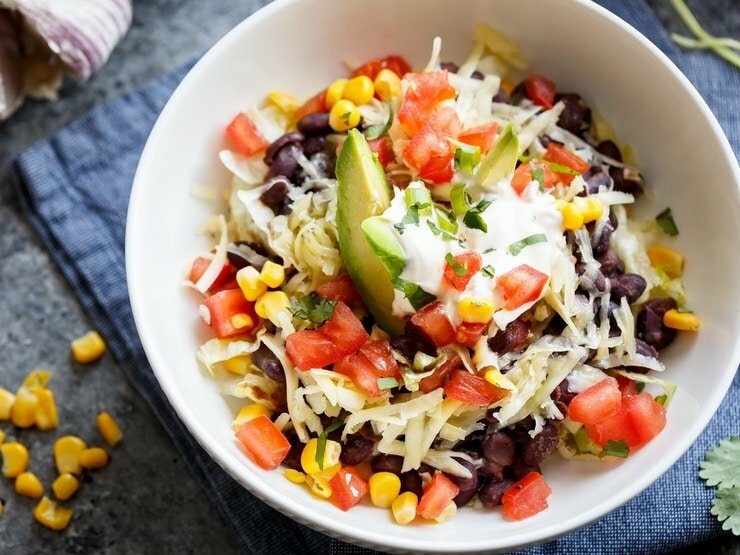 These Quinoa Black Bean Burrito Bowls are the perfect “flexitarian” lunch or dinner. It’s a deconstructed burrito, loosely based on Chipotle’s burrito bowl. I’ve replaced rice with cilantro lime quinoa to add protein and nutrients. Black beans are simmered with onions, garlic, and spices for added flavor. I have listed several optional toppings, so you can make this bowl all your own. So many possibilities! I recently heard the word “flexitarian” used to describe a fellow food blogger’s eating habits. After learning more about the word, it seems to describe my diet perfectly. I eat vegetarian most of the time, reserving meat only for when I really crave it. In my case, that means I’m eating meat once or twice a week (sometimes less). My husband is the same way. Growing up in Israel, his mom cooked lots of vegetarian dishes like eggplant, hummus, and shakshuka. 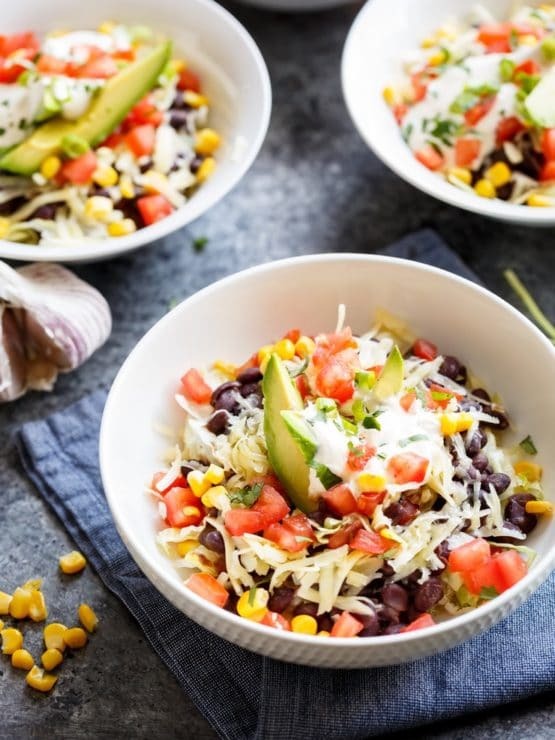 We’re happiest with a simple dinner of mushroom barley soup or lentils with rice— or these Quinoa Black Bean Burrito Bowls. Generally speaking, being a flexitarian feels right to my body. I don’t have trouble staying at a healthy weight, my cholesterol tests always come back perfect, I have lots of energy and I feel great. However, while I love eating flexitarian-style, I can’t eat too much soy, which is a major meat-free protein source. That’s one of the reasons I’ve been trying to work more quinoa into my diet; it’s a clean and healthy vegetarian source of protein. Native to South America, the ancient quinoa seed was once called “the gold of the Incas,” and was fed to their warriors to increase stamina. It’s been cultivated in the Andes for centuries, and was a major agricultural commodity in Inca and Aztec society. Only recently, quinoa has been “rediscovered” here in America, showing up on health food market shelves across the country. Quinoa is closely related to spinach; much like spinach, it is packed with nutrients. It is a terrific source of protein, amino acids, insoluble fiber, magnesium, riboflavin, and phytonutrients. Regular consumption of quinoa can improve your cardiovascular health, reduce the frequency of migraine headaches, and even decrease your risk of certain cancers. It’s also gluten free, which is helpful to people with Celiac disease and those who are on gluten-free diets. Make these Quinoa Black Bean Burrito Bowls vegan-style with toppings like pico de gallo, tomatoes, corn, or guacamole. Or, if you’re good with dairy, try shredded jack or cheddar cheese, lowfat sour cream, or even Greek yogurt. Spice it up with hot sauce or sriracha. I’ve added a new step-by-step video below to walk you through the process. These bowls are loaded good stuff, and packed with nutrients… it’s a simple, tasty meal you can feel good about! 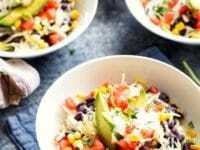 Cilantro lime quinoa with simmered black beans, lettuce & your choice of toppings. Lunch, dinner, easy, healthy, gluten free, vegan or vegetarian. Nutrition Facts listed are per bowl, and will vary based on toppings used. 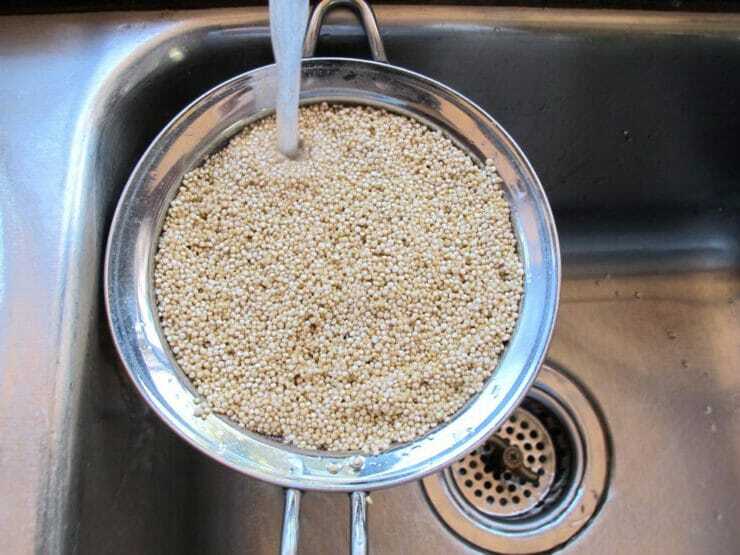 Rinse the quinoa thoroughly in a mesh strainer or sieve, drain. Pour quinoa into a saucepan along with 2 cups of water. 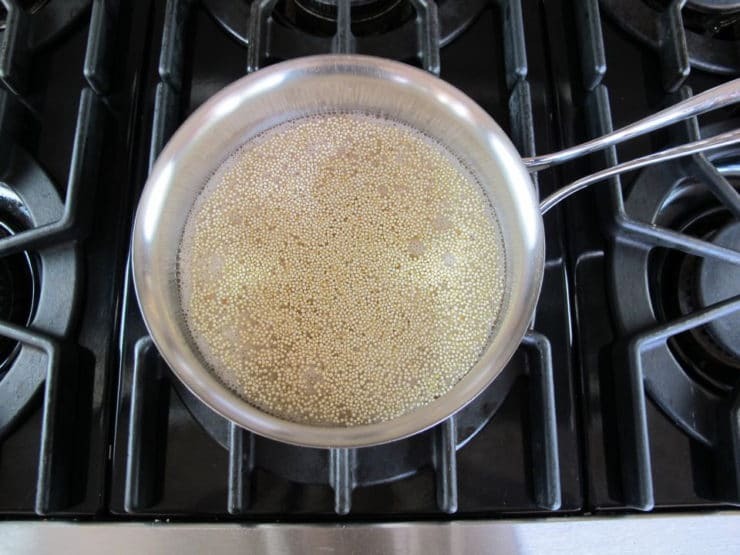 Bring the quinoa to a boil, then reduce heat to a low simmer. Cover the pot. Let the quinoa simmer for about 20 minutes till it becomes tender and all the liquid has been absorbed. Keep a close eye to make sure the quinoa doesn't burn. While quinoa is cooking, heat 1 tbsp of oil in another saucepan over medium heat. Pour minced onion into the saucepan and saute for a few minutes till it softens and begins to turn brown. 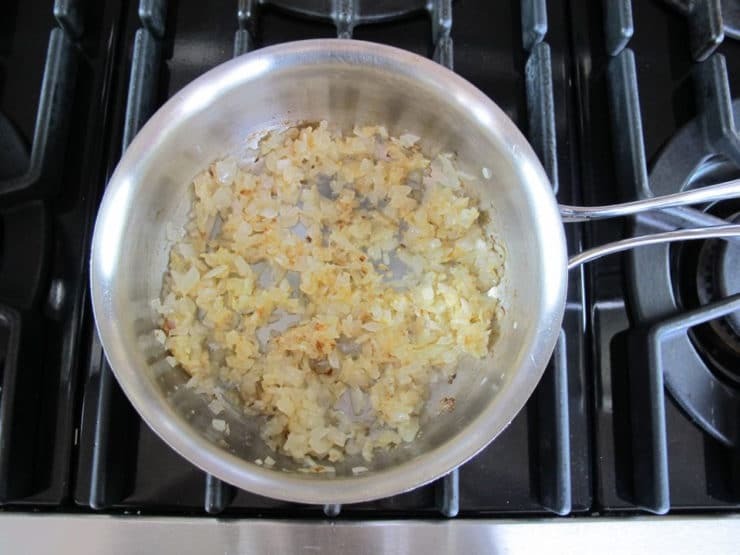 Add the minced garlic to the pot and let it saute for 1-2 minutes longer till aromatic. Add the black beans to the pot of onions along with 1/2 cup water, 2 tbsp of chopped fresh cilantro, chili powder and cayenne pepper. Bring the beans to a boil, then reduce heat to medium low. Let the beans simmer for 15 minutes till the liquid is mostly evaporated. Stir in 2 tbsp of fresh lime juice. Season with salt to taste. When the quinoa is fully cooked, remove from heat and fluff with a fork. Use the fork to mix in 2 tbsp of chopped cilantro and 2 tbsp fresh lime juice. Season with salt to taste. 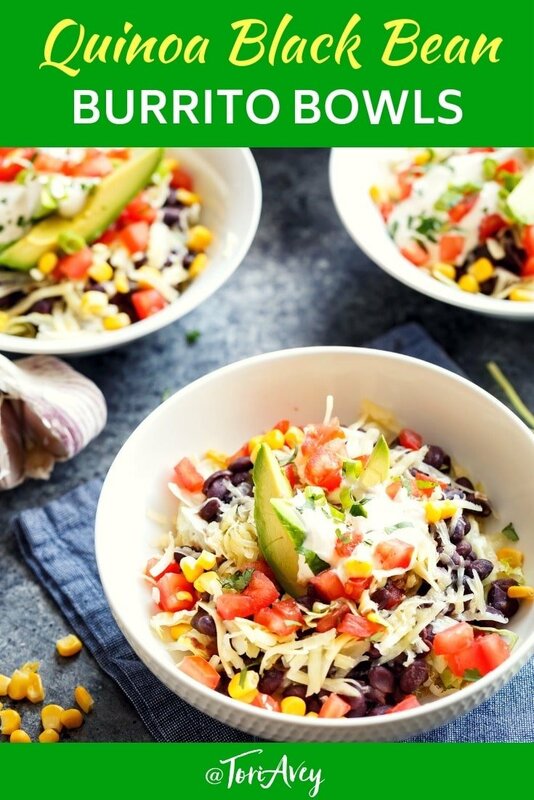 Assemble your burrito bowls. 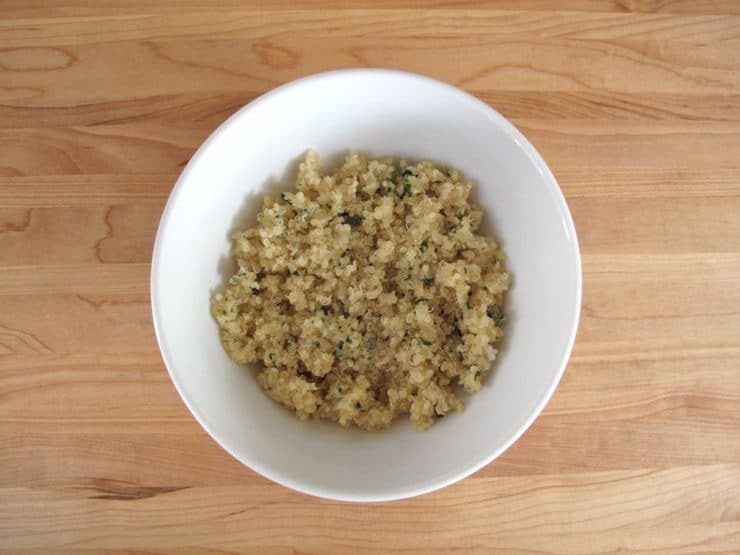 Divide the cilantro lime quinoa between four bowls. 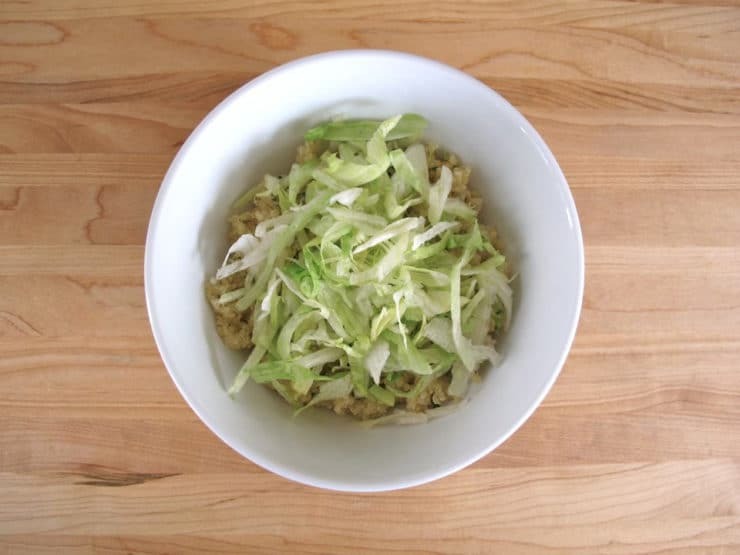 Top each portion of quinoa with 1/4 cup of shredded lettuce. 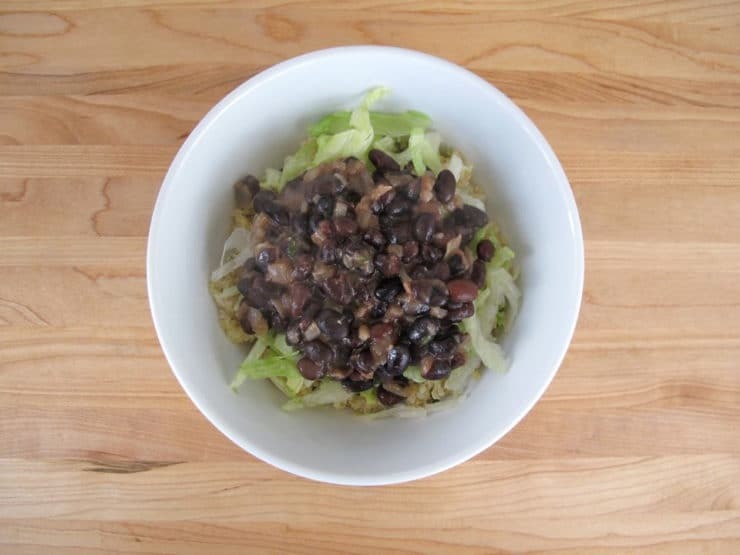 Top each portion of lettuce with simmered black beans. Top the black beans with your choice of Optional Topping Ingredients (ideas listed above). Serve warm. Nice! I will have to try this next time. I haven’t thought about this before. I anything with refried/mashed beans and Southwest flavoring. I have made a Caprese Quinoa Bowl with your usual suspect (tomato, mozzarella, basil and pesto, and parmesan). Recently, I made a vegan Quinoa Bowl where I cooked the quinoa in turmeric and black pepper for extra nutrition, and topped it with chickpeas dressed in Olive Oil, herb roasted mushrooms and whole garlic cloves, sweet corn, red onion, and crunchy carrots. Check it out on my Instagram @jonschowthyme, https://instagram.com/p/Bum2jhHgRbM/! I really like the new recipe builder many folks are using. I cook for one or two and it’s so easy to adjust. Thanks for using it! This recipe is delicious! Thank you for sharing! This is a delicious recipe! I made it tonight and my husband loved it as much as I did! Such an easy recipe, with ingredients I almost always have on hand. Thank you for sharing. 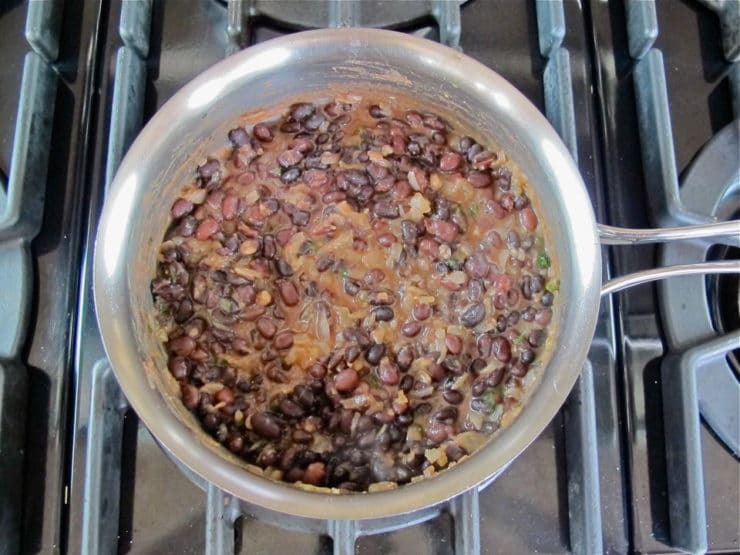 Do you cook beans ahead of time or throw them in the pot right from the can? If using canned I recommend rinsing them first in a colander, then adding to the pot. Canned beans are essentially cooked already, but some might need to simmer a little longer to achieve desired tenderness. Here the simmer is more about melding the flavors than cooking. I don’t have any lime? Will it still be delicious? Yes it will still be good. You can also substitute a little lemon juice if you have. So good…and so good for you, with lots of fiber and vitamins! I did add ground cumin to my black beans though. Extremely flavorful and satisfying. Thank you for such a great recipe! My family loves this recipe! Thank you, Tori. I love my burritos but have become somewhat of a ‘flexitarian’ recently after watching Earthlings (note: not recommended if you love your meat!). This ticks all the boxes — coriander (cilantro), chilli and avo on the side. I’m making this now but having wild and brown rice instead of quinoa (had loads lately). If only I could pack more protein in this without using meat… Any suggestions? You should check the protein count of the quinoa and black beans. Both are loaded. Cheese and sour cream would add a few grams more. This has become a staple in our weekly menu! It is one of my favorite dishes! Thank you so much for a great dinner and even better leftovers! How many calories would one bowl of this be? It depends on the toppings used. The calorie info above refers to a bowl with no toppings, only quinoa and beans. You would need to calculate each topping individually since the recipe is customizable that way. This was one of the nicest meals I have ever eaten. Just wanted to say thank you! 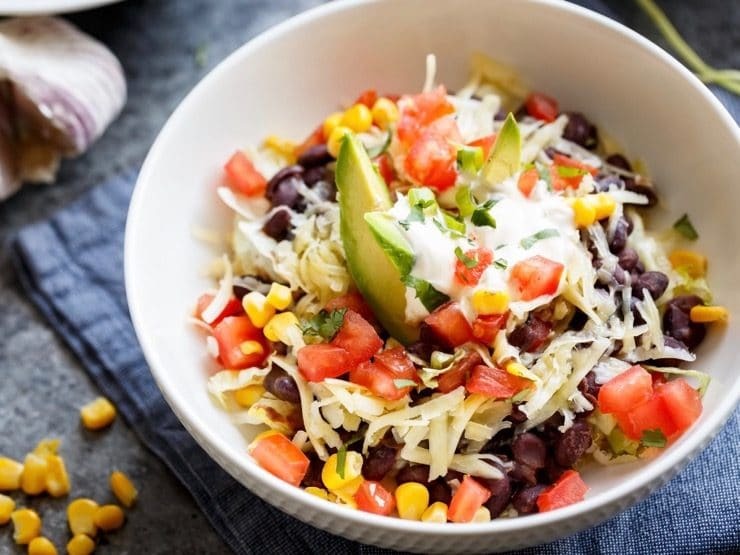 We love the Quinoa Burrito Bowl and will be trying more of your recipes. Just found your site and I’m signed on! Just finished your Quinoa Burrito Bowl. Absolutely delicious. Not a scrap left. Will have to double the recipe next time. Didn’t use chili powder, just cayenne and cumin…topped with salsa, avos, corn, lots more cilantro and another squeeze of lime. A feast! Thank you, thank you. Great Janis! So happy to hear that. My daughter recommended this recipe and sent me the link. I used Oikos French Onion yogurt dip instead of plain yogurt in the salsa, and roasted some peppets and onions along with a few chicken breasts for my teenaged son. Also used baby spibach leaves in the place of lettuce. 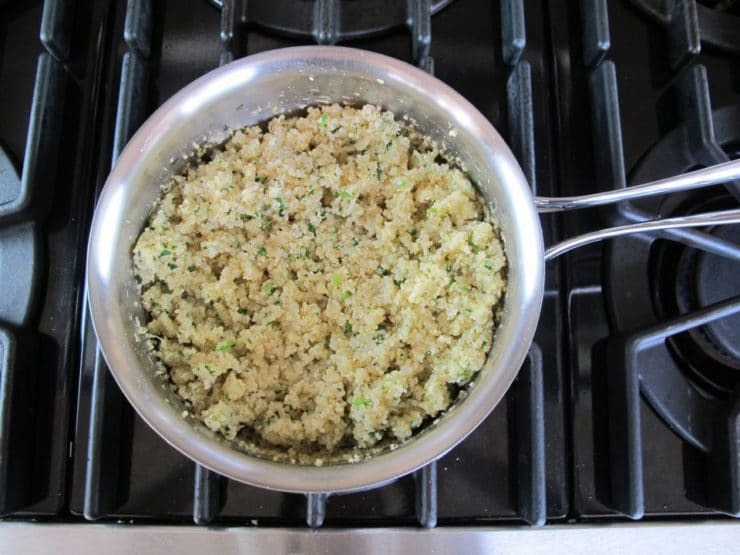 My daughter also told me to slice some garlic cloves and add it to the water I cooked the quinoa in. This was easily the best restaurant copy recipe I’ve tried! Does anyone know how many Weighr Watcher 360 points plus a serving is? Thanks for this awesomeness! I made these last night and they were wonderful!! I had some cooked quinoa in the freezer, so I just added the lime, cilantro and salt, and then made the rest of the recipe as directed. Such a great, fresh & colorful dish! I made these last week for myself and my Israeli boyfriend and we LOVED it!! Super-delicious, fresh, healthy, and best of all – filling! What a great recipe. Adding it to the rotation and appreciate you sharing this one! We absolutely LOVE ALL of your recipes!! Keep up the great work!! Will be making this recipe very soon!! So yummy looking and healthy too!! Thanks! I hate the taste of cilantro. 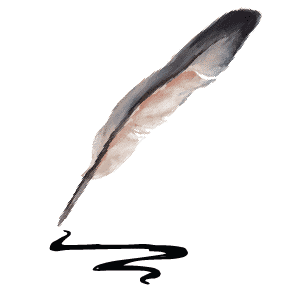 What is a good substitute-Parley? In this case I would just leave it out, you don´t really need it. Or you can substitute parsley if you prefer. I just made it for dinner. DELICIOUS!!!! Love it. I made it for dinner tonight. It was delicious! Very tasty. Very good!!! Made it for dinner with black soy beans. Yum! This is one of our favorite meals!